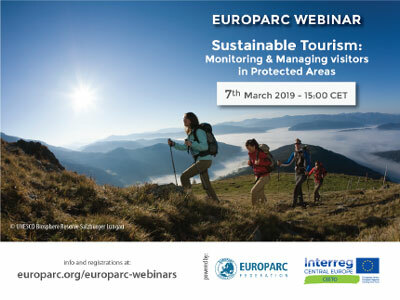 In the frame of CEETO Interreg Central Europe project (Central Europe Eco Tourism: tools for nature protection), EUROPARC Federation organises a webinar on Sustainable Tourism entitled “Monitoring & Managing visitors in Protected Areas”. The webinar will take place on March 7th 2019 at 15:00h CET and will give an overview on the best and more cost-effective tools to monitor tourist flows in protected areas. Tourism has been growing at an unprecedented rate in recent years, and areas of particular natural value are among those that attract a large number of visitors. The aim of the seminar is to empower all those who work in protected areas and provide recreation and tourism services or are responsible for the protection and management of protected areas in order to ensure the socioeconomic benefits of tourism, without compromising the conservation status of natural environment. The webinar will be in the English language and its duration will be 1 hr and 15 minutes. Participation is free, but registration to the webinar is needed.